4 weeks ago at 29+ weeks: I sat in a circle, surrounded by my girlfriends, who came out to celebrate our twins with us at yet another baby shower. (I haven’t blogged that one – but coming soon!) As I looked around the room at these beautiful women who had walked through so much with us, I was overwhelmed with emotion. Earlier in the day, my girlfriends who hosted asked if there was anyone I knew of that was still in the midst of an infertility struggle and I was overwhelmed with joy that as I looked at the attending guest list, I had been through the infertility struggle and walk with 10 of these friends of mine, all of them now with 1 or 2 babies in their homes, none left still struggling. In a way, it felt like a beautiful full circle moment, having celebrated 14 newborns during the time of our journey from this group of infertility-struggling friends alone, not to mention all the babies welcomed by those not struggling. And I got teary. Emotional with gratitude and joy and the feeling of immense relief. As I felt the tears pool in my eyes, I couldn’t help but feel so grateful being in this precious moment. 3 weeks ago at 30 weeks: I went in for a regular OB appointment only to have a mini-growth scan done a day earlier than our schedule one at the perinatologist and surprising news was given to us: our babies weren’t doing great. We were told our daughter dropped to the 3rd percentile, and our son to the 11th. They informed us that they would default to the perinatologist appointment tomorrow, but to pack a hospital bag, pray we could make it to 34 weeks, plan on steroid injections and a tough battle uphill head. And driving home I cried. Tears of exhaustion and worry for our little ones. Tears of carrying the stress, knowing their little lives were in my body, and feeling like I had failed them somehow. The next day: God surprised us! The perinatologist did so many thorough tests and assessments on these kiddos and we were left with the news that they are both doing amazing. The quick OB-scan was not accurate. Baby Boy stayed in the same percentile as before, the 33rd, weighing in at a whopping 3 lbs 4 oz! And Baby Girl went from the 5th percentile …. to the 15th!!!! And weighed in at 3 lbs 1 oz! PRAISE THE LORD! Both kiddos passed their weekly tests in record time and scored a 10/10 on all their points and the doctor said there was no need for steroids, we had two thriving kiddos, and to plan for a full-term pregnancy. This time driving home I cried too, but tears of joy and relief. Tears of gratitude to God for answering so many prayers for these babies growth and tears for the reminder that He is present with us in all the ups and downs. So halfway through, my gasps for air became too much and I passed the book off to Josh to finish reading outloud and let’s just say the tears fell. Tears of relating to the desire for children growing in our hearts. The challenges. The bitter disappointment. The answer to prayers. And ohhhh, there were so many tears. A few days later: Josh had a cupcake. A beautiful cookies and cream cupcake from my favorite cupcake shop and he sweetly offered earlierin the day, that he would share it with me after dinner that night. Oh sweet precious cupcake. We ate dinner and my belly grew so full so fast. And he immediately brought over the cupcake, to which I told him I didn’t want my half right now. Unfortunately thanks to a barking dog, he didn’t hear the last two words of my sentence …. the “right now” part. And so, an hour later, when I asked for my half of the cupcake, and the panic in his eyes set in quickly, there was a little bit of heartbreak to follow. And by heartbreak, I mean tears. Oh the poor boy. I tried to explain, through the most hyperventilating sobs, that it wasn’t his fault and I would be okay and I was sorry for being so hysterical, but let’s just say this type of emotional breakdown over a cupcake half isn’t normal for me. But the tears came. And fell. And I couldn’t get a hold of myself. Easter church service: Well, let’s just say that a day as significant as Easter combined with being 31+ weeks pregnant was a recipe for tears. As soon as the band played the first musical note, my eyes started leaking. And I cried, nonstop, for a full 30 minutes, as the worship band played and the verses were read and the significance of the day tore through my heart. I leaned over to Josh at one point and told him I physically couldn’t stop crying. It was like my body was responding outside of my mental emotions and reacting in a way I had never experienced before. And so, I soaked the rag I had in my purse (randomly) since I wasn’t wise enough to bring tissues. I finally stopped trying to wipe the tears away, instead letting them puddle in my cleavage. Oh the beautiful glamour of pregnancy. And then, just last week, I was driving and caught this song playing on the radio. And I realized that God gave us tears for a reason. As the lyrics of the song say, they are a healing rain. It’s okay to feel. It’s okay to get emotional and to let ourselves feel everything we are feeling. For so long, especially during our later years in infertility, I feared crying, because it felt like if I let the dam open, it may never close. I allowed myself to become numb, to push away feeling my emotions, to protect my heart by not connecting to it. Sure, I still cried about silly things – a sweet Dancing with the Stars performance, or someone winning the grand prize on Wheel of Fortune, or a dog reuniting with their military owner, but for me? For us? It was too vulnerable. And so this song, and all the tears of the weeks prior, felt like such a blessing to me. A relief to be reminded that God wants us to feel, that He gave us emotions for a reason, and that there is no shame in crying. It’s not a sign of weakness, but of humanness. So today friends, if you need to cry, cry. Put this song on (repeat if you need to) and close your eyes and allow yourself to feel. It’s healing. It’s hard. It’s beautiful. It’s messy. (Have Kleenex nearby but if not, I’ve learned a rag works great too.) But it’s necessary to release the pain and exhaustion and allows God to rebuild your strength as you cling to him. Tears …. who knew there were so many forms? Thank you for sharing this Chelsea. I’ve been crying tons and I’m grateful for being able to express emotion in such a way. The tears just continue to fall over the years and even more so since becoming a mother. I used to hide my tears but now I don’t mind sharing them with others. 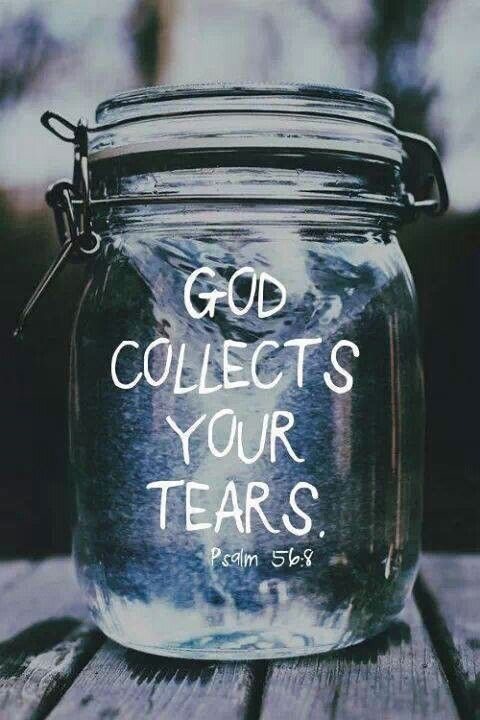 So glad God collects and cares about our tears. P.S I always cried about food when I was pregnant! I’ve cried in church more than a few times (not even pregnant, but probably on some infertility meds and other times just because). If you can’t cry in church, where can you cry? 😉 I think when you live a hard season of life, you get tired of emotion, but it’s freeing to be able to cry. I laughed really hard- then started to cry at your story about the cupcake. I have so been there. I have been crying long before I entered Earth, if that resonates with anyone. In this moment, my tears are for my son… who is my hero. He was diagnosed with paranoia schizophrenia just last Oct. I blog about my journey to ease my pain (https://fighterwarriormom.blog/) … Thanks for your words. They were a blessing to me, especially.